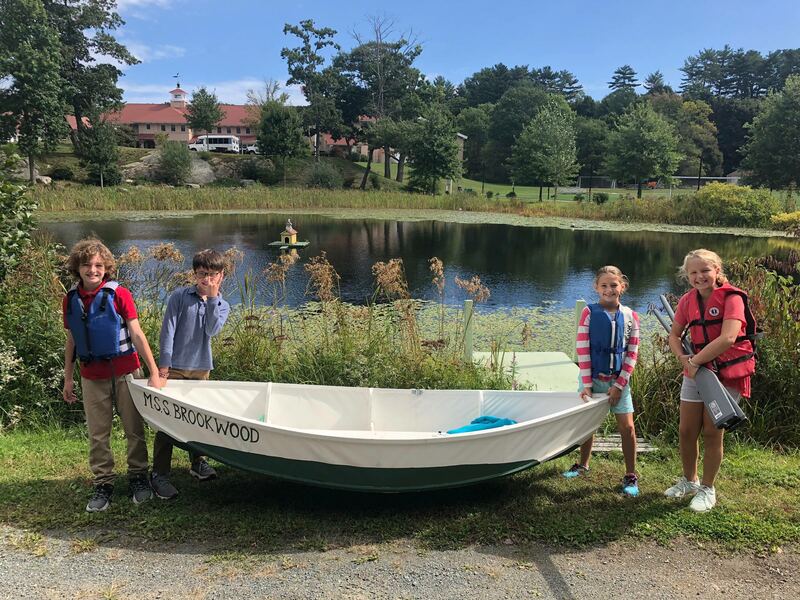 Middle schoolers have the privilege of taking MSS BROOKWOOD out rowing on Cutler Pond on the edge of the school grounds. Halfway between Swampscott and Gloucester on the Massachusetts North Shore is Brookwood, a private school serving students from pre-kindergarten to the eighth grade. Located in an area with a rich maritime history, it was, perhaps, inevitable that boatbuilding would work its way into the school’s curriculum. The idea had been floating around the school’s faculty for a few years and when one of the school’s classrooms was scheduled to be vacant during the 2015/2016 school year, the space was available for a workshop. Sven Holch and his fellow fourth- and fifth-grade teachers took the opportunity to introduce 90 students to “design thinking and project-based learning” under the guise of hands-on boatbuilding. The students were divided into nine “watches” with maritime names like Stellwagen, after the Stellwagen Bank fishing grounds. Every week, each watch would gather in the Boatyard, as the classroom had been named, ready to do some boatbuilding. The design chosen for the build was the 9′ canvas-on-frame double-ended tender designed and built by Ned MacIntosh back in the 1940s when he and his wife were living aboard their Atkin cutter STAR CREST in Panamanian waters. The boat caught on among other cruisers, especially after Ned added a sailing rig. Soon there was a fleet of about 20 of them. When STAR CREST returned home to New Hampshire Ned made more of these lightweight tenders. Maynard Bray, an author of many books on boatbuilding and a frequent contributor to WoodenBoat, saw the tender, took a liking to it, and measured one of them to create drawings to work from to build one for himself. His plans were the starting point for the Brookwood project. 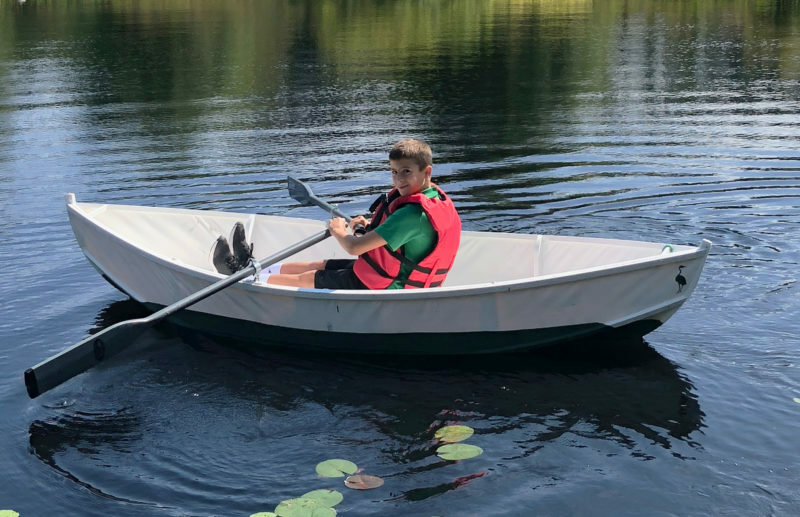 The canvas boat has held up well for the three years it has been used by students to practice rowing on the school’s pond. The boat was launched on Cutler Pond, situated between the school and its soccer fields, and christened MSS BROOKWOOD in a ceremony led by Head of School Laura Caron, made Admiral of the fleet for the occasion. The MSS stands for Middle School Ship. 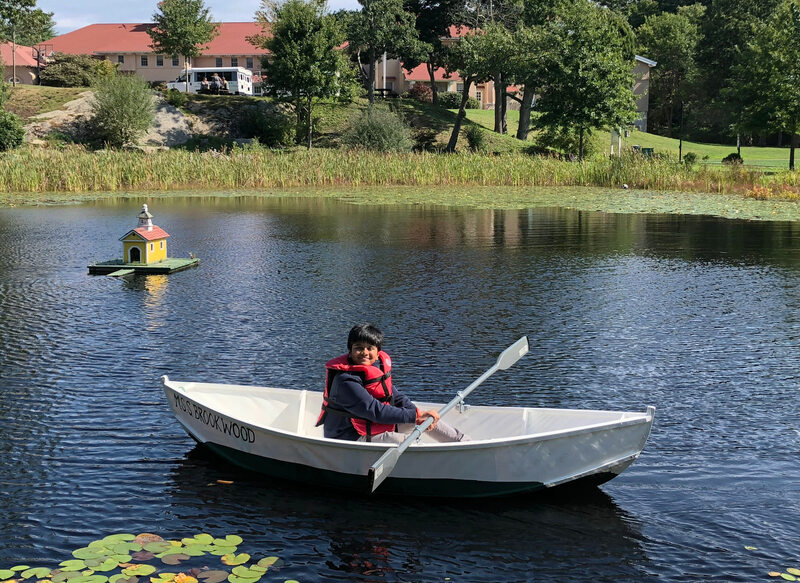 Students took turns rowing around a duck-sized schoolhouse—complete with a Brookwood-style cupola—that floats in the middle of the pond. Rowing became the next learning opportunity after the boatbuilding. The boat’s bow bears the heron from the school’s logo. The pond is a good habitat for herons, so the school chose it as its symbol when the school was founded in 1956. This version is now “old school,” as the logo was updated this summer. Since its launching, MSS BROOKWOOD continues to rule the pond unchallenged and hasn’t leaked a drop. The day this was published the elusive, great blue heron made an appearance at the pond, what a good omen! We will be ice skating on that pond in a few short weeks! Does anyone know if the lines of this fine craft are available anywhere? 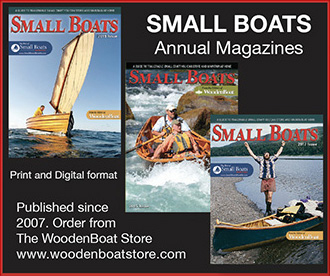 We did a review of the MacIntosh canvas boat in Small Boats 2014. The author of that review, Maynard Bray, drew up the plans, as noted in our article above, and still offers them. For details, contact him.